I started running back in 2000 as a simple way to not gain the dreaded freshman 15. Someone talked me into running my first race in 2002 and the rest is history! I quickly fell in love with the runners high and running community. I have now completed 70 half marathons and just recently completed my 12 marathon. 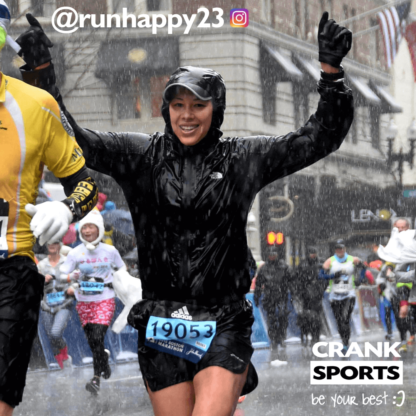 In 2018, I also ran (or swam) in my first Boston Marathon and now I’m hungrier than ever to chase another BQ!!! e-Gel was a huge part of my training and race day nutrition and I truly believe it helped me achieve getting to Boston. I have been using e-Gel for about 2 years now as my running coach highly recommended it based on the fact it was a bit higher in calories and contained sodium. I would often bonk during half marathons and marathons despite using various gels but once I tried e-Gel there was no turning back. It provided me with the energy I needed for the race while having great consistency and taste. I now solely use e-Gel for my long run nutritional needs. My personal favorite is Mountain Rush! e-Gel has half the sugars of GU and other leading energy gels and it’s the only Electrolyte Energy Gel with 4 times the sodium and double the potassium. And, with 150 carbohydrate calories, e-Gel packs 50% more energy than most competing energy gels. Get more energy, no sugar BONKS and complete electrolyte replacement to avoid cramping and injuries! e-Fuel is low sugar and loaded with complex carbohydrates for sustained energy along with antioxidants and balanced electrolyte replacement. Gluten free and NO artificial flavors, colors or sweeteners … Just Clean Energy!